Great Stirrup Cay is private island located in the Bahamas, here you can relax in a hammock under a palm tree on its white sandy beaches, or swim in the beautiful turquoise water to spot some of the colourful coral reefs and sea life this paradise island has to offer. Great Stirrup Cay has an abundance of water sport activities to suit all the family. 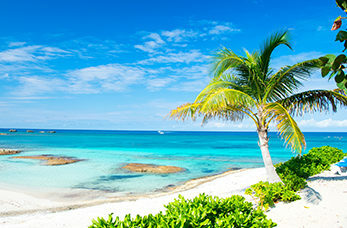 You can snorkel the pristine waters, paddle boat or Kayak around the island, or even parasail high above the island for a spectacular view of the Bahamas. Take the weight off your feet and relax on the beach with a chair, under an umbrella or in a hammock, get a soothing massage or try your hand at beach volleyball and Ping-pong. Get active and take a guided tour through the Berry Islands on board a Wave Runner, you'll get to see the Lighthouse at Great Stirrup Cay, Slaughter Harbor and the abandoned island community of Cistern Cay. Snorkel in the calm blue waters of the Bahamas and get up close and personal with some Stingray's, you'll get to pet, feed and play with these wonderful creatures.